Velvet is a material full of contradictions; its style credentials are often dependent on the season, trend and even the garment. For example, opt for slim-cut velvet black trousers and you get called refined, if not ‘Old Hollywood’. Yet combine too many colours, select a looser cut or choose crushed velvet, and you end up being compared to a washed-up circus clown – or hear Austin Powers jokes for the rest of the evening. It’s a true statement material that takes no prisoners. Velvet’s luxuriousness, smooth and soft texture and slight sheen will draw attention in any situation, but only if it’s worn correctly. With this in mind, a little – a simple accessory or considered block-coloured piece – often goes a long way on the style spectrum. Although there’s something classic about velvet, it frequently gets lumped in the womenswear realm of fashion, along with the likes of chiffon, lace and silk. However, menswear had its head turned back in 2012, with the fabric prominent within many high fashion AW12 runway collections. Instead of being a fleeting, single season trend, velvet has since developed into a modern wardrobe staple that is perfect for party season – its refined and eye-catching nature cannot fail to make an impact at any event you choose to wear it to. For AW13, high-end collections such as Etro, Giorgio Armani and Dolce & Gabbana have utilised the material liberally, pairing it with everything from leather bomber jackets to floral blazers; within this context, it has become the new ‘neutral’ piece. A velvet accessory’s impact and effectiveness are akin to handbags in womenswear: a perfect complement and a visual draw, but one that could soon become too distracting. Topman Turquoise Velvet 5cm Tie. Depending on your personal style, velvet might only be appropriate in small doses. If this is the case, a single accessory in a solid, neutral shade makes a subtle and refined statement. Consider a pair of solid black/navy Oxfords or dress slippers, or enhance your straight-and-narrow work wardrobe with a tie, waistcoat or pocket square in forest green, brown, blue or burgundy. Whenever a new material, pattern or even cut turns into a trend, a man glancing at his current wardrobe staples often asks, “How can I incorporate this without buying a whole bunch of other pieces?” For certain looks, especially in the present, the blazer offers the greatest degree of versatility. Two current statement trends, colour and velvet, create all types of stylistic possibilities. At a base level, opt for a solid black, navy or burgundy slim-fit blazer and then experiment with hue and/or pattern mixing from there. 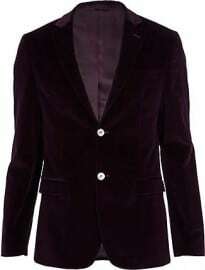 Designers from Alexander McQueen to Dolce & Gabbana and Etro have taken the velvet blazer up a notch this year with contrast piping, patterns, embellishments and varying degrees of bright colours – all of which will offer an instant upgrade to any go-to blazer, shirt and trouser/jean/chino combination you regularly wear. Just make sure that you anchor your choice of velvet blazer with simple, neutral pieces – there is no room for another statement item within your outfit. Much like blazers, trousers are given a welcome injection of sophistication and character by velvet. Even an ordinary slim-fit pair of black trousers are given an upgrade that’s simultaneously modern whilst still classic and refined. At the same time, cut plays a huge part in how well a man wears velvet trousers. If too loose, the trousers mirror velour tracksuit bottoms, albeit a more premium take than is prominent within certain subcultures on the high street. Too tight, on the other hand, and they begin to look like something you might spot on an ageing rock star still attempting to keep his career relevant. Unless you’re looking to make a colourful statement, sticking with neutral, darker tones like black, navy, brown or eggplant enhances what’s essentially a wardrobe staple. Select a modern cut that’s appropriate for work and still casual enough for a night out: ideally, a slim-fit that’s not too tight around the thighs and calves. This way, that pair of velvet trousers becomes a step up for your wardrobe, rather than a piece that doesn’t quite work with what you already have. Head-to-toe velvet? It’s one look with two possibilities: smooth and suave, or unnecessarily retro. Like trousers, cut and colour define the style more than the material itself. Specifically, as plenty of vintage velvet suits circulate around the internet and second-hand retailers, opting for an older cut sets you back a few decades – great if that’s your intention, but more of a faux pas if it’s not. Much like for trousers, velvet enhances standard solid-colour tailoring. Essentially, to own a suit that lasts longer than just this season, select a more form-fitting cut and a neutral tone that pairs well with classic white, blue or patterned dress shirts. Then simply combine with your existing shirt and tie combinations – try not to over-think it and make sure you wear with rock-solid confidence. Last year, velvet had all the markings of a flash-in-the-pan look – one that could easily disappear after a season. Yet with celebrity icons continuing to show up on the red carpet in velvet suits and the material giving your basics a glamorous edge, it’s a trend that has quickly turned into a sophisticated alternative and less of a novelty; a material that, purely through texture, sets you apart from the crowd.